Keep yourself safe from, skids and slips while out and about with the 1 Pair Anti Slip Grip 5 Metal Teeth Cleats Spikes Shoe Crampons. This shoe cover gives you the grip you need on slippery surfaces this winter season. We know how hard it is to walk and run errands under this season’s conditions and it’s better to be safe than sorry. This anti-slip shoe crampon has ice spikes underneath that grips through snow and ice. 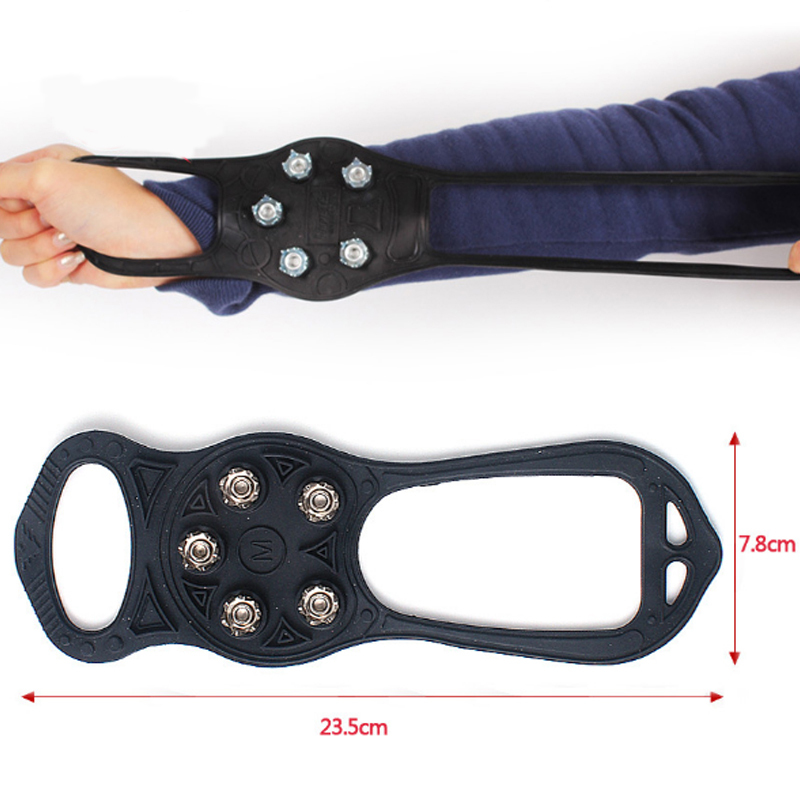 The grip makes walking stable and safer for its user. The 1 Pair Anti Slip Grip 5 Metal Teeth Cleats Spikes Shoe Crampons is made from a high-quality silicone material that can endure freezing temperatures without breaking. It has 5 stainless steel claws at the bottom which gives the perfect anchorage for your shoes. Its best feature is that it is designed to fit any shoe size making it cost effective. It measures 23.5 cm in length and 7.8 cm in width and could be stretched to fit your shoes’ soles. It is highly portable and fits in your bag without any hassle. Instead of getting cleated shoes that are extremely awkward to use indoors or those chained crampons that pose to damage your shoes (and doesn’t look attractive), this simple yet effective shoe cover grip is the perfect one for you. Get the 1 Pair Anti Slip Grip 5 Metal Teeth Cleats Spikes Shoe Crampons for you and your loved ones. Keep them protected from slips and falls, saving yourself and your family from life-threatening situations. It is affordable since it fits most shoe sizes without any difficulty. Made from non-corrosive materials, these are durable and guaranteed to last long. Enjoy the outdoors and get yours now! Durable and works good. No slips! I have the ones with the chains and buckles but decided to try this one. These are more comfortable to wear and nicer to look at. Good one! Get them! You wouldn’t regret it! Shipping’s fast. Great quality item. Thank you Gadget Cheetah. Always so fast ! These are really good. Topnotch. And fits without worries.